Who will you surprise with our online gift card? Giftcard to send digitally. Decide the value you would like put on the card. Choose an image suitable for the occasion and don’t forget to send a personal message. The recipient will receive the gift card in their mailbox with your personal message, directly after your order has been completed. 1. Which amounts can I choose for the Gift card? You decide which amount you would like to spend on your Gift card. The minimum amount you can put on the card is 15 euro and the maximum amount is 100 euro. 2. How do I know if the Gift card has been delivered? If you have completed your order you will receive an e-mail from us with confirmation of your purchase and of your message sent. The one who you are surprising will at the same time receive the Gift card with the personal message in their inbox. 3. How long is the Giftcard valid for? 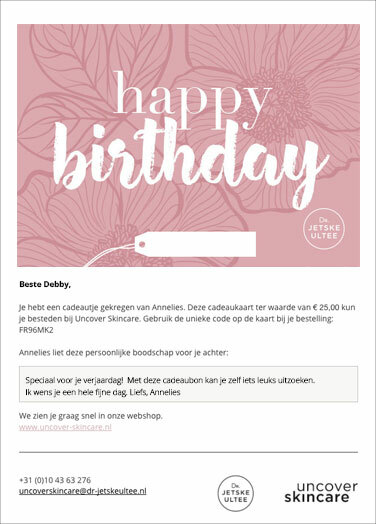 The Giftcard has no expiry date and can be used to purchase all products in the Dr. Jetske Ultee web shop. 4. How do I use the gift voucher? A unique code is sent with the Giftcard. This code can be used when you complete your order from your shopping basket. Would you rather give the Giftcard personally? When ordering, put your own e-mail address in both the sender box and the receiver box. You will then receive the digital gift card in your inbox for you to print out.